The present case report shows one such Class II subdivision malocclusion case which was treated by asymmetric extractions. First premolars were extracted in the upper arch and the first premolar on the Class I side was extracted in the lower arch. This approach is independent of patient compliance and saved one premolar along with good posttreatment occlusion and a slight improvement of the profile. A 16-year-old Malay boy complained of corner teeth sticking out in the upper arch. Extra oral examination showed a mildly convex profile with posterior divergence, competent lips, an average nasolabial angle, and lower facial height with no gross asymmetry. Intraoral examination showed all 28 teeth present with moderate crowding in both arches and a lower midline shift to the left of midfacial axis with acceptable overjet and overbite. The molar and canine relation on the right side were in Class I occlusion, whereas on the left side were in Class II occlusion with Class II division 2 incisor relation [Figure 1]a.
Cephalometric examination showed a mild Class II skeletal relation, proclined lower incisors with average growth pattern [Table 1]. All third molars were visible on orthopantomogram [Figure 1]b with satisfactory oral hygiene. To constitute a good esthetic smile with correct centerlines. Extraction of two premolars in the upper arch to correct crowding and one premolar in the lower arch on Class I side to correct midline and crowding. The patient chose the third option as only three premolars were being extracted and was willing to accept a Class II molar relation on the left side. Anchorage reinforcement was needed to prevent mesial molar movement in the upper arch; this was achieved by cementing a Nance button [Figure 2] as the treatment involved the extraction of the first premolars in the upper arch to correct the crowding. Treatment started with the placement of 0.022½ Roth prescription brackets and molar tubes. Leveling and alignment were done using 0.012½ Ni-Ti and 0.017½ × 0.025½ Ni-Ti wires. The patient was monitored and recalled every 6 weeks to check progress. Finally, 0.017½ × 0.025" stainless steel wire in the upper arch and 0.019½ × 0.025" stainless steel archwires were placed in the lower arch. The upper and lower anteriors were then consolidated together, and en-masse retraction was performed using active tie-backs [Figure 2]. Final space closure was done using power-chain. Once the occlusion settled, the appliance was debonded. Retention was achieved with Modified Hawley retainers in both arches. The time taken for leveling and aligning was 7 months and 11 months for space closure and settling. On the right side, the Class I molar relation was maintained, whereas on the left side, the Class II molar relation showed better intercuspation. At the end of treatment, a proper overjet and overbite were maintained with coincident midlines and a slight improvement of the profile was seen [Figure 3]. Comparatively lesser compliance needed from the asymmetric extraction approach seems to be superior to the alternative requirement of Class II elastics. In comparison to the extraction of four premolars, extracting three premolars are more acceptable to the patients. In the present case, we achieved the goals of profile improvement and clinically as well as functionally acceptable occlusion. Finally, a proper case selection and treatment plan are must to achieve optimum treatment results. Alavi DG, BeGole EA, Schneider BJ. 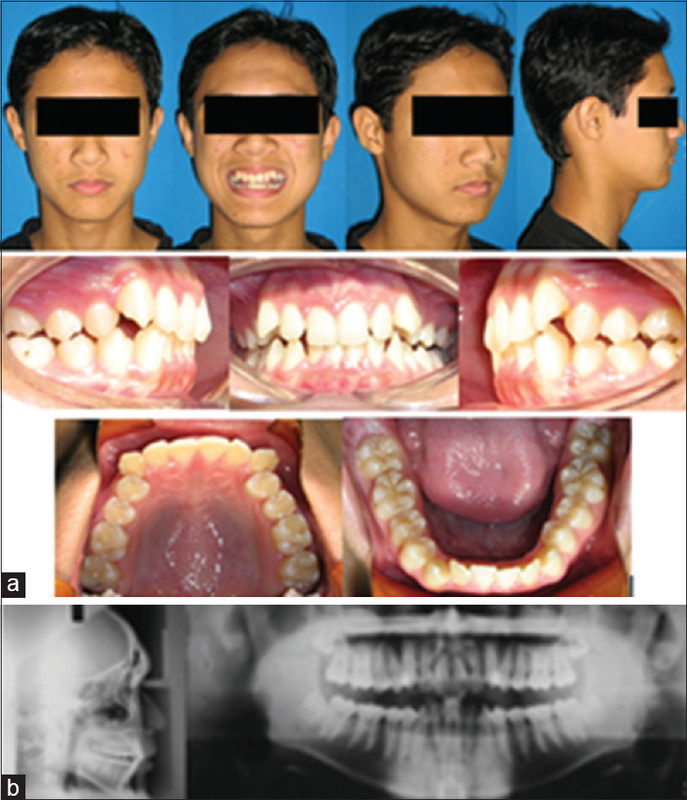 Facial and dental arch asymmetries in class II subdivision malocclusion. Am J Orthod Dentofacial Orthop 1988;93:38-46. Janson GR, Metaxas A, Woodside DG, de Freitas MR, Pinzan A. Three-dimensional evaluation of skeletal and dental asymmetries in class II subdivision malocclusions. Am J Orthod Dentofacial Orthop 2001;119:406-18. Janson G, Woodside D, Metaxas A, Henriques J, Freitas M. Orthodontic treatment of subdivision cases. World J Orthod 2003;4:36-46. Janson G, Cruz KS, Woodside DG, Metaxas A, de Freitas MR, Henriques JF. Dentoskeletal treatment changes in class II subdivision malocclusions in submentovertex and posteroanterior radiographs. Am J Orthod Dentofacial Orthop 2004;126:451-63. Janson G, de Lima KJ, Woodside DG, Metaxas A, de Freitas MR, Henriques JF. 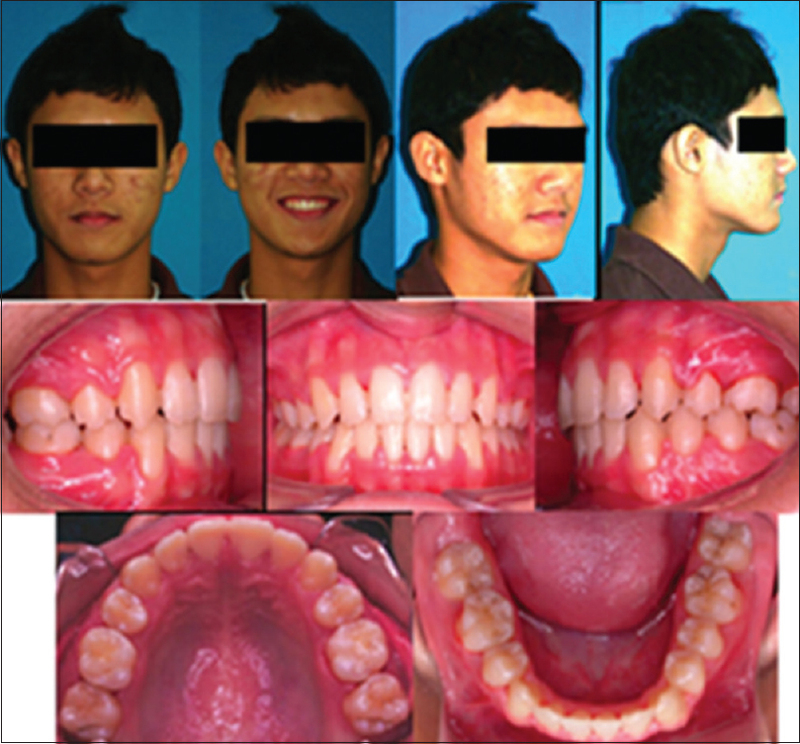 class II subdivision malocclusion types and evaluation of their asymmetries. Am J Orthod Dentofacial Orthop 2007;131:57-66. Janson G, Carvalho PE, Cançado RH, de Freitas MR, Henriques JF. Cephalometric evaluation of symmetric and asymmetric extraction treatment for patients with class II subdivision malocclusions. Am J Orthod Dentofacial Orthop 2007;132:28-35. Janson G, Cruz KS, Barros SE, Woodside DG, Metaxas A, de Freitas MR, et al. Third molar availability in class II subdivision malocclusion. Am J Orthod Dentofacial Orthop 2007;132:279.e15-21. Mohammad HA, Abu Hassan MI, Hussain SF. 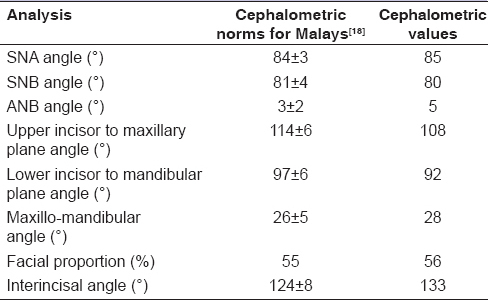 Cephalometric evaluation for Malaysian Malay by Steiner analysis. Sci Res Essays 2011;6:627-34. Rose JM, Sadowsky C, BeGole EA, Moles R. Mandibular skeletal and dental asymmetry in class II subdivision malocclusions. Am J Orthod Dentofacial Orthop 1994;105:489-95. Steyn CL, du Preez RJ, Harris AM. Differential premolar extractions. Am J Orthod Dentofacial Orthop 1997;112:480-6. Fink DF, Smith RJ. The duration of orthodontic treatment. Am J Orthod Dentofacial Orthop 1992;102:45-51. Burstone CJ. Diagnosis and treatment planning of patients with asymmetries. Semin Orthod 1998;4:153-64. Lewis PD. The deviated midline. Am J Orthod 1976;70:601-16. Cheney EA. The influence of asymmetries upon treatment procedures. Am J Orthod. 1952;38:934-45. Cheney EA. Dentofacial asymmetries and their clinical significance. Am J Orthod 1961;47:814-29. Todd M, Hosier M, Sheehan T, Kinser D. Asymmetric extraction treatment of a class II division 1 subdivision left malocclusion with anterior and posterior crossbites. Am J Orthod Dentofacial Orthop 1999;115:410-7. Wertz RA. Diagnosis and treatment planning of unilateral class II malocclusions. Angle Orthod 1975;45:85-94. Janson G, Araki J, Estelita S, Camardella LT. Stability of class II subdivision malocclusion treatment with 3 and 4 premolar extractions. Prog Orthod 2014;15:67.